Our three diving boats, Wahoo, Old School and CTD Newton, are the best way to get to the amazing dive and snorkel sites in Grand Cayman! Both our duskies were built in Fort Lauderdale, FL, and our Newton was built in Louisiana. All our boats were brought down via Key West and Cuba by the crew on two epic, 54-hour journeys. Ask the crew about it! The boats & engines at Cayman Turtle Divers are regularly maintained & updated to be in the best condition possible at all times. We've got plenty of dry storage, shade, iced water, and snacks on every voyage. Feel free to bring your cell phone, iPod or MP3 player so we can jam to your tunes on our rockin' sound system! You came to Cayman to be on and in the water, not in a car! That's why, as often as possible, we arrange to pick you up and drop you off with our boats right on 7 Mile Beach! Our outboard motor boats allow us to be one of the only operators on island that can back our boats up right in front of your hotel or condo. There's no faster or more fun way to reach your dive site! 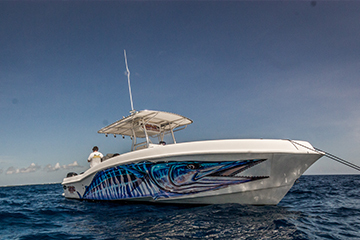 Wahoo and Old School are dusky 33's centre console with twin 300 Suzuki motors. If you're not a horsepower expert, let's just say these boats are fast! This gives us the option to comfortably cruise or superjet out and back to your dive sites of choice so that we can maximize your bottom times! 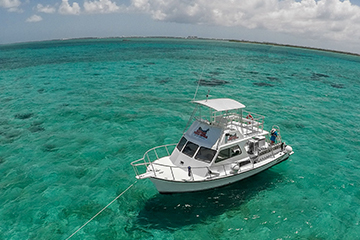 Our newest edition, CTD Newton, is a 36ft newton dive special and offers a huge dive platform and plenty of shade. While not as fast as the duskies it is still going to get you there faster than anyone else. Our boats allow you to choose how you'd like to enter the water! 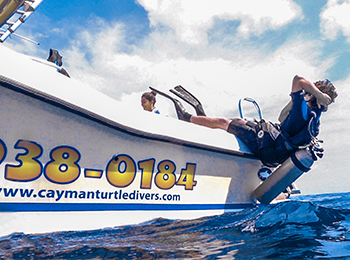 The diving boats at Cayman Turtle Divers are top-notch because we take our responsibility to providing you the best Grand Cayman diving experience seriously! Contact us today for information on dive rates and prices.